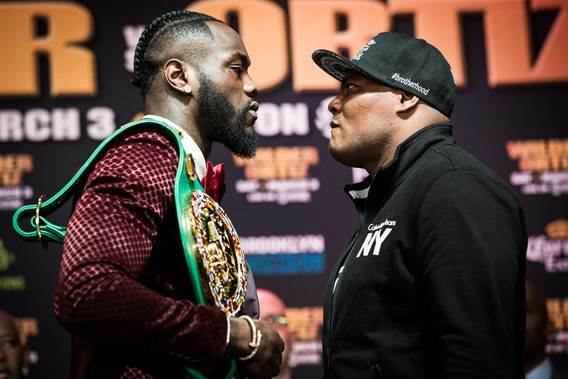 Unbeaten WBC Heavyweight World Champion Deontay Wilder and unbeaten contender Luis Ortiz exchanged words and went face to face at the final press conference in Manhattan Thursday ahead of their main event showdown this Saturday, March 3 live on SHOWTIME from Barclays Center, the home of BROOKLYN BOXING™, and presented by Premier Boxing Champions. Also participating in Thursday’s press conference and opening the SHOWTIME CHAMPIONSHIP BOXING telecast at 9 p.m. ET/6 p.m. PT were super middleweight contenders Andre Dirrell and Jose Uzcategui, who meet in a rematch of their May 2017 matchup on SHOWTIME as they fight for an interim 168-pound world title in the co-feature. “The reason I wanted this fight is not only do I think Ortiz is one of the best technical fighters in the division, but he’s the boogeyman that everyone is running from. Champions have avoided him and I’ve always said I was the best and this is my chance to prove it. “This result isn’t up to anyone but myself. Every time I get under the bright lights, I give the fans what they want to see. This is the best versus the best and that’s what boxing deserves. “I had all the excuses in the world to run away from this fight after he failed the test. There are a lot of good, up-and-coming heavyweights out there, but I wasn’t interested in them. This fight is how I prove that I’m the baddest man on the planet. “On March 3, with all the personal things put aside, it’s going to be an honor to fight Luis Ortiz, man to man and father to father. I know that family is his motivation, just like it is for me, and that’s why I blessed him with this opportunity. “The exciting thing about Saturday night is for everyone to see what I’m capable of doing. Luis Ortiz is determined to get my WBC belt. This is my seventh defense of my title and I’ve enjoyed every one. It’s a lot of responsibility and I take it seriously. You’ll all see on Saturday night why I’ve said the things I’ve said. “Everyone knows what I’m expecting Saturday night. I can’t say it enough. I have knocked every opponent out for a reason. I plan on continuing my knockout streak. That’s what I do and that’s what I’m best at. “I never say anything bad about fighters because inside the ring, anything can happen. I respect everyone who steps into the ring. This is my opportunity. This is my time. Deontay is a great champion but this is my chance. “Like I always say, this is my time and it’s going to be a great triumph. This is big for all of Cuban boxing and I will make my country proud. “This is going to be like two trains on the same track about to collide. I’m going to win and I’m going to take his belt. “This is not a video game. This is not using controllers. You have to actually step into the ring with me on Saturday night. “Deontay is scared. He’s talking a lot of nonsense. He’s worried about what I’m going to do. This is my time. I’m going to show everyone. “I’m 100 percent ready to go. Sparring has been amazing and I’m totally prepared for Deontay Wilder. Deontay’s biggest mistake is that he talks too much. “I looked into his eyes and I knew that I’m not going to lose this opportunity. I’m going to be the first Cuban and the first Latino born outside the country to win a title. Saturday night will be historic. “It was a rocky start for me in our first fight. He caught me with a good shot in the early rounds, but I was able to fight through it. I started to dominate the second half of the fight but he had definitely thrown my game off. I still weathered the storm and made good things happen. This fight is very deserving of a rematch and I’m looking forward to it. “This fight right here is one of the beautiful moments we have in boxing. There were two wrongs that night in the last fight. I’m really happy with everyone who has made this rematch and gave the sport what it deserves. “Now Jose Uzcategui and myself both have chances to prove ourselves again. This is going to be the worst opportunity of Uzcategui’s life. But it will be the best opportunity for me. “This is my opportunity to prove all of the critics wrong this time. I’m not the favorite, and it’s a beautiful thing. I’m going to change every single mind on Saturday night. I’m stepping up to the plate, and I’m preparing to hit a home run. “Virgil Hunter has definitely helped me with my mental game. We’ve worked on a masterful game plan. Virgil is tough to work with but we did all of the necessary things we had to in order to accomplish what we have to on Saturday. “We’re not doing anything differently heading into this fight. I’ve put the time in at the gym every day to make sure that the fight ends conclusively this time. “Before I even got to the ring in the first fight I felt some animosity from the referee towards me and it kind of led to what happened in the fight. “Saturday night you’re not just going to see that I’m a boxer-puncher, but you’ll see my full power on display. “I’m happy to be in this rematch. I hope that Dirrell brings action like he’s talking about on Saturday. I don’t want to chase him around the ring all night. “Deontay Wilder put everything aside to face one of the greatest amateur heavyweights in the history of boxing. This fight is happening because Deontay is that good and he’s that proud. Deontay is ready to prove that he’s the baddest man on the planet. “There is a sensational off-television undercard beginning at 5:30 p.m. at Barclays Center that includes a group of top contenders and prospects. It’s really a loaded undercard from top to bottom. “That great undercard includes a woman’s title fight involving Alicia Napoleon. Everyone involved in this fight has made an effort to have women’s boxing represented on our cards and I’m proud to be able to deliver that for fans. “This will be Deontay’s third defense of his title in Brooklyn at Barclays Center. He successfully defended against Artur Szpilka and Bermane Stiverne, with two frightening knockouts. I’m proud to work with Barclays Center and promote boxing in Brooklyn. This is certainly one of the best venues for boxing in the world and certainly a venue that is dedicated to bringing the fans consistently excellent programming inside the arena. STEPHEN ESPINOZA, President Sports & Events Programming, Showtime Networks Inc.
“When we have a fight card like this, the network gets a lot of credit but these fights truly don’t happen unless fighters like Wilder and Ortiz are ready to take the fights. “When we announced our schedule back in January, there was one fight that jumped out to everyone, and it was Wilder vs. Ortiz. They have 67 fights between them, 67 wins, 0 losses and 62 knockouts. This is part of what we’re calling ‘March Madness’ on SHOWTIME. All four heavyweight titles, the top four heavyweights in the world, including Anthony Joshua vs. Joseph Parker on March 31, facing each other this month on SHOWTIME. There hasn’t been a lineup like that put together by any network in the history of the sport. “The titles are great but these fights are about something else. They’re about legacy. When people look back and ask, ‘what kind of fighter was Deontay Wilder?’ This is the fight that they will talk about. More important than knockouts and unbeaten records, this is why fighters are remembered. “Deontay, even though you weren’t born in Brooklyn, we do consider you our own. We’re excited to have Luis Ortiz as well, for the first time, on Saturday night. This is a card from top to bottom that’s incredible and I’m thrilled to welcome Andre and Jose to Brooklyn.